It’s summertime, and travel is easy. There is no need for heavy coats, waterproof shoes, hats, or gloves. So I’m issuing a challenge to my LLT readers. It’s time to take your packing to the next level by sizing down. I am a curvy older woman, so never use leggings as pants. I don’t wear tank tops without a covering either. Just….no. In spite of these limitations I can still get my gear into a 16 L backpack. I think that you’ll be able to downsize too. 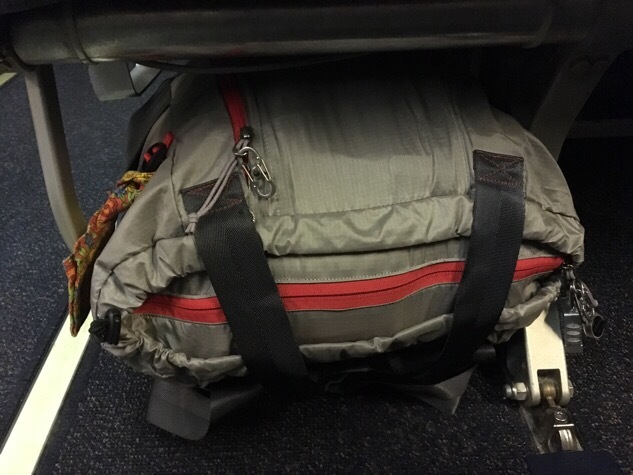 I hope to give my readers some shortcuts by showing the techniques I used to travel with a 16 L backpack. In closing, I’ll bring up the Song of Solomon which states that the “little foxes spoil the vineyard” (Song of Solomon 2:15). It’s true! All the seemingly innocuous little things can slowly and quietly eat away at our later success. The concept is also true for packing. An ounce here, a cute dress there, and all of a sudden we have a big heavy suitcase. I’ll be showing you how to stamp out the little things that keep you from packing light. Just returned from a 2-week international trip (city and country, mix of business and pleasure) with REI Overnighter pack and a personal item. I’m up for the challenge of just the Overnighter pack, or maybe all the way to just a personal item for my next trip. Looking forward to your posts, and Thank You for your terrific site! I’m planning to reduce what’s in my bag before we take off for a 3 month trip to Europe. Thanks for all your good advice and inspiration! Based on many of your tips, over the past few years I’ve reduced my luggage to one international size carry-on and no personal item. But, that one bag weighs 25 pounds and is full. I’d like to find a way to reduce enough “foxes” to have it only 1/2 to 3/4 full and at less than 20 pounds. That way when I return with a few souvenirs, I don’t have to add a tote bag to an overflowing suitcase. I’m anxiously awaiting your strategies in your next few posts. Thanks Cindy! I’m a 60 yo, plus size solo traveler (can’t pawn stuff to a traveling companion). I’m going on a 3 wk cruise/land trip to the Baltics in August. I currently travel with 3.9 lb, small, 22 inch, wheeled carryon. I already use air pillow packing material to fill the empty spaces in my suitcase. I no longer take a personal item (only a small crossbody purse). On my last trip my suitcase weighed 18 lb 2 oz. My goal is to reduce the suitcase weigh to less than 17.5 pounds. At this point cutting 10 oz will be a challenge. I will take the challenge. I’m taking my son, a high school senior, on a quick trip to multiple cities to check out potential colleges over four days. Because of our schedule, (fly in, spend night, tour school, grab taxi, airport in late afternoon for next city, etc. ), we will have to carry our stuff with us during the tours. Therefore, I’m committed to carrying everything in a large purse, and son will carry only a backpack. It will be a challenge as I have never gone without at least a carryon/suitcase. With me luck! You can most certainly do this! The biggest thing to remember is that most of the bulk and weight in our bags comes from “stuff”. I’m talking about the toiletry kit, our electronics, the makeup bag, the shoes, etc. Clothing takes up only a small part of the bag, but it is the thing we concentrate on. Look at your toiletry kit and electronics for weight and space savings.